We know we are getting to the end of the day when Dr Seymour’s jokes start to get pretty bad. As the day starts to pass it’s time to buckle down and get on to our end of day checklists to try and make life here a little easier for everyone. We start to prepare the trays for the dentist’s patients for the following day, print out the daily banking and make sure receipts and computer records match up to the dentist on duty. We make sure lab work for the next day has arrived, balance the petty cash tin, start emptying contaminated rubbish into the clinical waste bins, print check lists for next day, make sure all instruments are scanned and packed away. Also we prepare the clinident suction solution bucket to sterilise suction hoses, restock materials that are low, vacuum and dust areas that need to be cleaned. We also check bathroom is in order, tidy the kitchen and double check health engine appointment availability is up to date. We nurses do this all while still continuing with administration, nursing and attending to patients. Team effort is important to ensure a stress free end of the day. The workday is coming to an end and we are all grateful but we still are not done yet. When the last patient is completed we need to finish off his payment, book another appointment if required and let him out. The ‘closed’ sign is placed on the door, and the office phone is to be diverted to the paging system and last duties on our checklist start to get done. The nurses will then close the banking for the day, clean the surgery, and run the solution through the suction. But there’s more – set up the first patients tray, turn all dental chairs off, and close all programs on all computers. We all make sure the air conditioning and compressors are off and we load the last autoclave for the night. We also carry out the ultrasonic foil test. 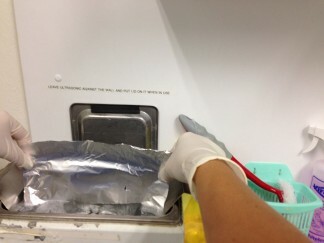 The aluminium foil is vertically placed into the ultrasonic bath solution. 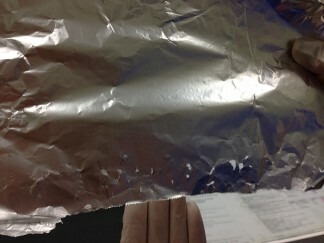 If it is successful the foil will show tiny perforations. This is then logged in the computer, and the ultrasonic bath is emptied and allowed to dry out. Then we do the infection control check list and log this in the computer. Next all x-ray machines and OPG machines are switched off. We put away the banking tin and pack all keys away lock all doors make sure all rubbish is placed in the right bins. We have a biological contaminated waste bin, sharps container, plus general rubbish and waste paper. Finally sign off on the checklist that all things that have been completed. At last we set the alarm and lock the door but not before helping Dr Seymour with his bags because god forbid he had to carry it on his own. There just too heavy for him to deal with. I can go on but we will be here forever. So there is a little bit of what some of our day consists of as a dental nurse. I need a rest but now I have to deal with the traffic home!